Wow!! I have been remiss. The port has continued to work well over the past year. I am still on Kyprolis (carfilzomib) although the dose and regimen has changed last March. Instead of a normal dose taken for 2 days a week for 3 weeks followed by a week off, I am now on a double strength dose for two days every other week. This works better for my travel schedule. So, Warren and I decided that perhaps I should add the dexamethasone back in and see how I fared. I am happy to report that my issues with nausea have decreased and my sleep situation is about the same. So now, I only take the dexamethasone on the first of the two days of treatment. Warren has also told me that he has patients who have been on Kyprolis for over 2 years. It seems there is precedent for the direction I seem to be heading in. I hope that my next communication will not take as long as another year. But if it does, I would hope that it would only mean that things have been puttering along in similar fashion to this last year. Thank you, Lord Jesus, for my healing and for all the healing received by those fro whom we pray. I had a port inserted on October 7th, and then left for Madrid on a business trip on the 11th returning on the 16th – my second ‘birthday’ since receiving my transplanted stem cells. The reason for the port is that, for me – and others from what I understand from the infusion nurses at Lynn – is that Kyprolis (carfilzomib) is toxic to the veins that circulate this drug to the myeloma cells. What apparently happens is that upon being successfully punctured by the needle for a current infusion, somehow the wall of the vein is not strong enough to hold the flexible tube left behind upon the needle removal, and the infusion tube slips out of place. Since it was becoming increasingly difficult to find a vein in either arm to successfully infuse my next dose, it seemed the port was the best way to go. Both for my own comfort and for work of the infusion nurses. All of what you see is actually placed below the skin. And the ‘purple’ part, the port, becomes a raised ‘bump’ under the skin. 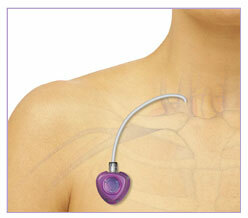 The tubing leads to a large vein (the jugular) where the tube continues down into the heart. In use, it’s really quite simple, the infusion nurse uses a specially designed needle that punctures my skin and the septum of the port simultaneously allowing both the taking of blood samples and the infusion of medicine. The infusion nurses were almost ecstatic on Monday when they learned I had the port and that their work would be so much easier for them AND for me. I am in the fourth cycle of Kyprolis now, finishing next week. The last cycle that ended September 22 had results for everything in range but the M-Spike which continues its downward trend and is now at 0.35 (the goal is “not detected”). The next sampling for this testing takes place on November 6 and I expect to start the fifth cycle on November 9. Thank you, Lord Jesus, for my healing and for all the healing received by those for whom we pray.